Cameras come in a plethora of shapes and sizes. It has become progressively difficult to find to choose the right one for you. We will try to break down some of the basic technical terms found in specifications and feature lists. That way, you can have a clearer understanding of the capabilities of any camera. As you may have learned from other courses, a raster image, which a digital photograph is an example of, is made up of basic units called pixels. Image resolution can be considered as an area with a height and width measured in pixels. Zoom in close enough to a raster image, and you will see an array of squares. Each of that square is a pixel. So, for example, an 800×600 image would have 480,000 pixels total. The modern digital camera has the capacity to shoot pictures well into the megapixel range (1 million pixels or more). Even that tiny front-facing camera on most of today’s mobile phones can shoot a two megapixel image. Resolution was or still is associated with higher image quality, which prompted what is now known as the Megapixel War. Perhaps it can also be regarded as a race, because it is an unending cycle of manufacturers putting out a camera that can shoot pictures at higher resolutions than the competition. However, the increases have diminished in significance over time. The proportion of difference from one to two megapixels was nothing short of epic back in day. However, while technology has advanced by leaps and bounds since then, the difference between, let’s say, 46 to 50 megapixels would not be so dramatic. The effect of pixel count on actual image quality has long been a point of debate, which may be best left outside this manual. But one definite disadvantage of a higher resolution is that you have more pixels to work with. It is definitely preferable to down-sample, or take away pixels to reduce an image, rather than up-sample, or add interpolated pixels to enlarge an image. The former usually leads to a sharper, more detailed image. Ther latter, on the other hand, relies on your software’s level of sophistication and can only be done so much before the degradation of quality becomes apparent. Where as the traditional analog camera had film to expose captured images on, the modern digital camera has what is called a sensor. A camera’s sensor captures light and converts it into digital data. While there seem to be no strict standards followed, there are sizes commonly found across different camera models. 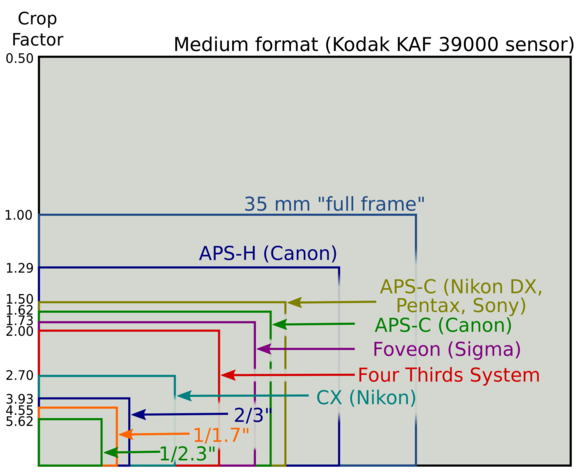 Camera sensor sizes and crop factors. Taken from www.techhive.com. Reminiscent of the Megapixel War, there is also a popular belief that bigger is better. The physics behind the argument is compelling. A bigger sensor captures more light per frame, and therefore leads to a higher density of data to work with. Aside from higher resolutions, this could allows for a higher dynamic range. A bigger sensor also has the potential to allow for better images in low-light conditions. The reality of whether or not bigger really is better, however, is not so simply decided. While a bigger sensor does bring image quality benefits to the table, its level of significance relative to the user does vary. Larger sensors also lead to larger and heavier cameras. And yes, building a hardware ecosystem around a camera body with a larger sensor is an expensive affair. Cameras can magnify, or zoom in to get up close to a subject. This can be done either optically with a lens, or digitally by the camera’s processor. Generally speaking, optical zoom yields better images. However, it often makes for a larger camera (or lens) size. ISO is the third element of what is called the exposure triange — a topic to be covered later in this manual. It is also one of the more prominently marketed items in a camera’s set of specifications. ISO is the level of sensitivity that a camera is capable of. At its simplest, a higher ISO means the ability to achieve proper exposure with less light and at higher shutter speeds. The drawback is that a higher ISO often leads to more noise. The amount of this noise is also not consistent across different models. For example, just because a camera can shoot clean pictures at ISO 800 doesn’t mean others can do so equally. The ability to record video has become more and more important for what were originally digital still cameras. Mobile and DSLR videography, have become artforms by themselves. Therefore, it will be important to look into this feature, if you intend to do any meaningful video work with your camera. The two arguably most important parameters to check is video resolution and speed. As of today, the most relevant are HD and Full HD which are 1280×720 and 1920×1080 pixels, respectively. Larger resolutions such as Quad HD (2560×1440) are also becoming popular and are expected to become standard in the coming years. A camera is also typically able to record at 24, 25 and 30 frames per second (fps). Sometimes, 60 fps is possible. An important thing to note with DSLR cameras can typically record video for only 20-30 minutes at a time, regardless of available space. There are two reasons for this. One is that these cameras require a huge amount of processing power to record video, and recording for extended periods can lead to damage. But what is perhaps the more relevant restriction is not technical in nature. DSLRs that are able to record more than 30 minutes of video would be classified as video recorders which entail higher duties and tariffs within the European Union, which are ultimately passed on to consumers who would have to deal with higher street prices. Digital still cameras have not quite reached a point where it can definitively replace dedicated video cameras. But some can certainly do video recording well and satisfy most of your needs. __________. (2015). Megapixel myth…why it is not all about megapixels!. Retrieved December 17, 2015 from http://www.practicalphotographytips.com/tag/Megapixel-Myth.html. Chan, N. (2012). Why digital cameras have a 30 minute video recording limit. Retrieved December 17, 2015 from http://www.tested.com/tech/photography/44445-why-digital-cameras-have-a-30-minute-video-recording-limit/. Dove, J. (2013). Demystifying digital camera sensors once and for all. Retrieved December 17, 2015 from http://www.techhive.com/article/2052159/demystifying-digital-camera-sensors-once-and-for-all.html. Mansurov, N. (2015). Camera resolution explained. Retrieved december 17, 2015 from https://photographylife.com/camera-resolution-explained. Meyer, J. (2015). Camera sensor sizes explained: what you need to know about Four Thirds, 1/1.7, full-frame and APS-C format. Retrieved December 17, 2015 from http://www.digitalcameraworld.com/2015/03/05/camera-sensor-sizes-explained-need-know-four-thirds-11-7-full-frame-aps-c-format/.